St. John Vianney, Cure of Ars, Patron Saint of Priests and a great devotee of St. Philomena. Many accounts of miracles within his church, he said, were through the intercession of St Philomena. 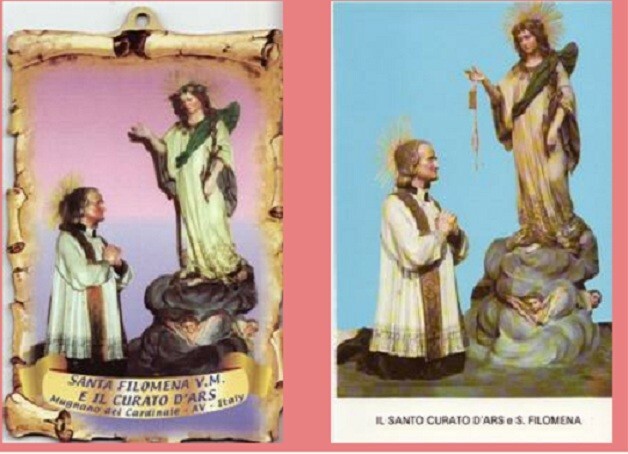 The image used on the St John Vianney and St Philomena items is of a full size statue in the Sanctuary of Saint Philomena, Italy. It is a paper mache statue which was made in 1890 at a famous school of art in Lece, Southern Italy.